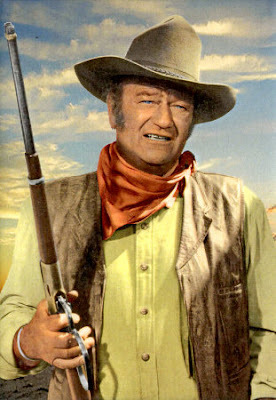 I’ve been watching John Wayne movies lately. Just watched the Howard Hawks-directed trio of Rio Bravo and its two variations - El Dorado and Rio Lobo - in sequential order. They are all good in their own way. If I had to combine them, I would take the Dean Martin character from Rio Bravo; the James Caan character from El Dorado and the Jack Elam character from Rio Lobo. Maybe because Deano is more believable as a recovering alcoholic, but I think he bests Robert Mitchum in the role as the down-and-out lawman who the Duke helps out. But then the young James Caan as the knife-wielding "Mississippi" out does the guitar-strumming Ricky Nelson as "Colorado" in Rio Bravo. And the wild-eyed Jack Elam is in top form as the crusty old guy with the itchy trigger finger who helps to guard the prisoner. There are many more Wayne movies.